Hi everyone! 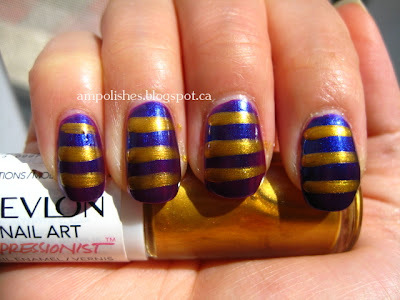 Today I have a couple more Revlon nail art polishes to share with you all. These nail art polishes are distinctly duo ended and expertly colour matched. I have two polishes from the Neon line and two from the Expressionist line. Click to see which colours I got! These neon polishes are part of Revlon's extensive duo ended nail art polish line. Each shade in this collection comes with a white base on one end. It is recommend on the Revlon site to apply 1-2 coats of white base first and then 2 layers of the colour polish to help brighten the neon effect. "Electrify your fingertips. Revlon Nail Art Neon™ contains a white base coat to brighten your neon with a pop of shocking color." The white base had nice coverage, I used 2 layers to achieve opacity and eliminate streakiness. The green is a wonderful chartreuse green. I used 1 layer in the swatch below. 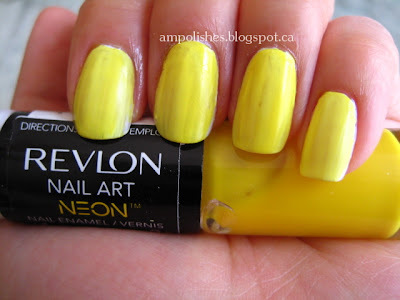 On the Revlon website they advise that you can "Brighten your neon with a white base coat for a pop of shocking color!" I thought the white base did make the green more vibrant and less polish was required to make the green stand out. However, I did use the green alone on another finger without a base and found that I could achieve the same intensity of green but had to use up to 3 layers. The white base had nice coverage, I used 2 layers to achieve opacity and eliminate streakiness. The yellow is a nice bright florescent shade. I used 1 layer in my swatch below, I should've used 2 because in the picture you can see how streaky the yellow is. It didn't look that streaky in person but when I was looking through the picture on the computer I saw how uneven the coverage was. 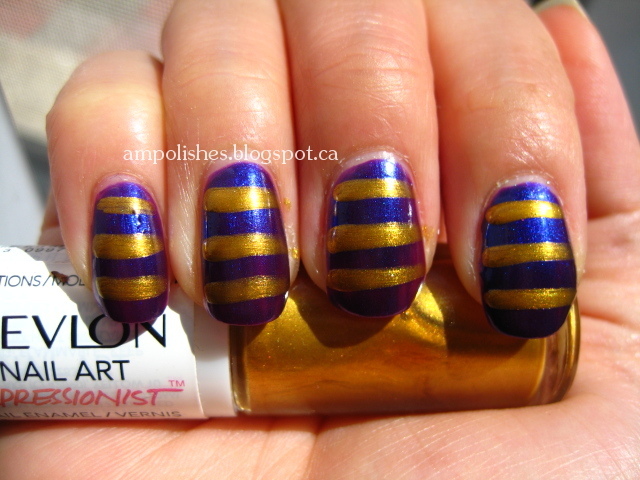 These Expressuonist polishes are also part of Revlon's duo ended nail art polishes. They are "...a palette of 10 curated color combinations [and finishes]." On one end is a regular sized brush and on the other is a thinner skinny brush. "Unleash your inner artist with expertly matched nail duos!" 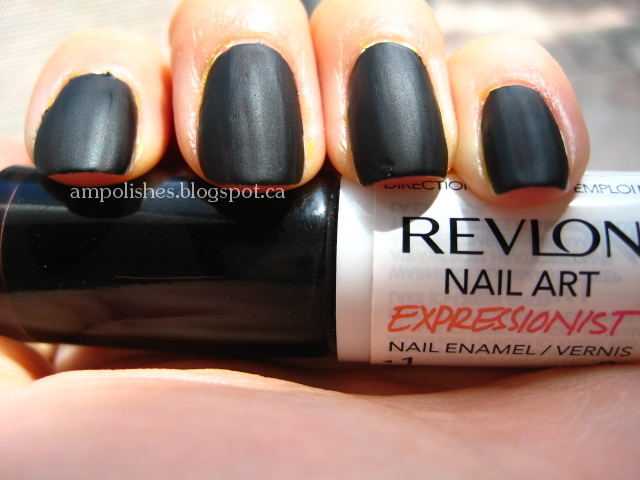 #1 is a matte black, I was a bit surprised that the polish was matte. I was expecting a glossy finish and was pleasantly surprised that it had dried to a soft matte texture. #2 is a creme white. 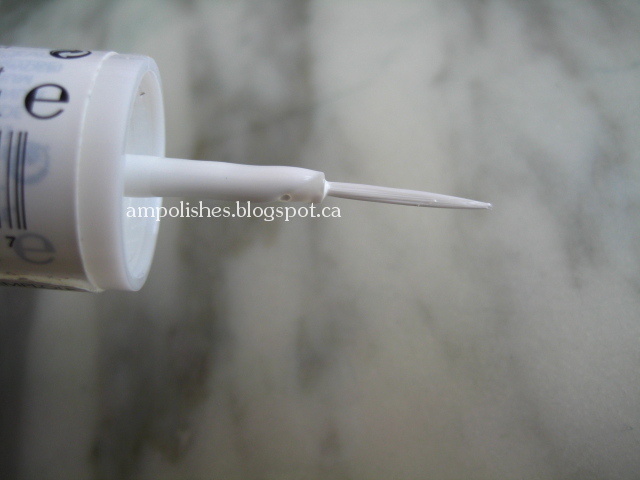 I felt that the "...skinny nail art brush..." brush was thin but not too thin to create very fine lines. #1 is a dark purple with a burple microshimmer. It applied to the nail very nicely and only required 1 coat to achieve opacity. #2 is a yellow gold, almost foil like when when you look at it in the bottle. I'm not sure how I feel about the length of the brush. I liked that one fluid stroke created a nice long line but the length also made me feel like I didn't have maximum control of the brush. 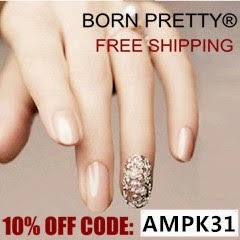 Overall I thought the polishes were alright, I like that there is a variety of colours available in each collection. Since the nail art polishes are duo ended I found that I had to be a little more cautious when I opened the bottle. I had to make sure the other end didn't accidentally open and leak polish out. Regular Revlon polishes are 14.7ml in size and these duo polishes are 7.8ml each, so technically you are getting more bang for your buck because I've seen the nail art polishes priced the same as the other Revlon nail products. 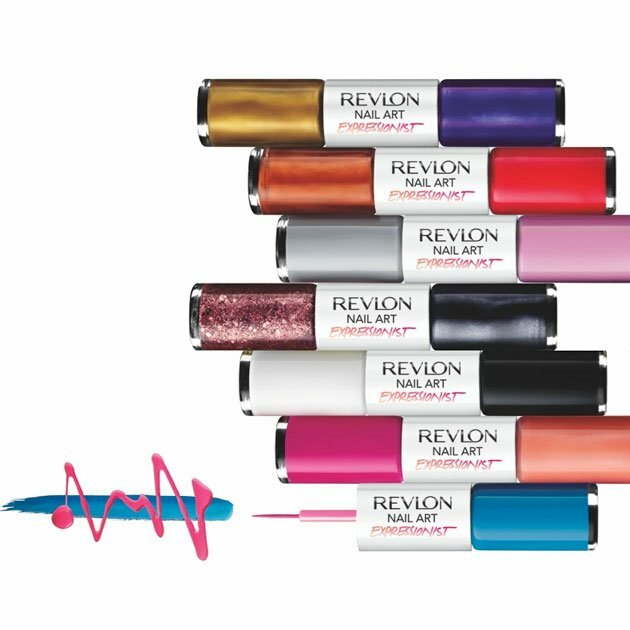 These Revlon nail art duo ended polishes are 7.8ml in size and are available in most drug stores across North America. Prices ranging from $6-10 depending on location and store. bleeehhh the yellow looks sooo streaky. On the bright side, the matte black/white combo looks awesome!